One of the enduring attractions of sea glass is our fascination with sea glass colors. A casual walk on the beach can quickly turn into a most memorable day if you happen to spot a piece of ultra rare red sea glass. The study of sea glass colors and their status on the sea glass rarity scale is a frequent topic in sea glass collecting circles and the competition is fierce among friends to find the nicest, most rare sea glass gems. Of course, there is a rather straightforward explanation for why some sea glass colors are more valued than others. Sea glass rarity and value are tied to the simple rule of supply and demand. The more rare the glass color, the greater the likelihood that there was a very limited supply of that color. And conversely, the more plentiful the supply, the less status the color has on the sea glass rarity chart. 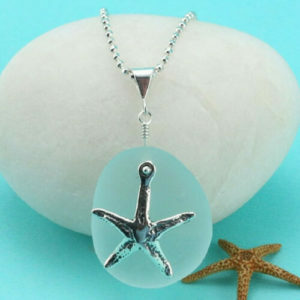 Other characteristics such as size, shape, condition and age also contribute to sea glass rarity and assigning rareness and value to those pieces would be on a case by case basis. 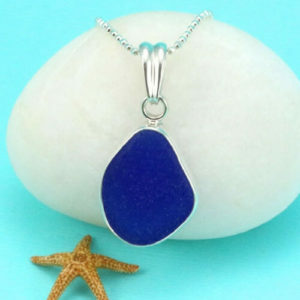 Here’s a look at the different sea glass colors and their rarity, as well as links to any fine sea glass jewelry we have available for sale in that color. Orange is the most rare sea glass color mainly because there was very little orange glass made. Orange was never a popular color for mass produced bottles so most orange sea glass is probably from decorative tableware, art glass/vases and maybe the edges of red warning lights. There is a derivative of orange glass called Amberina, a yellow/orange hue which was popular in the 1930s when it was used to make decorative glass objects. 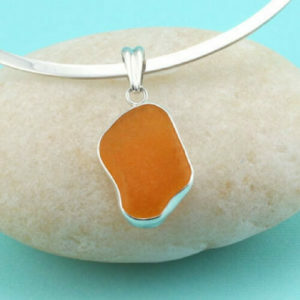 A quality orange sea glass specimen, made into jewelry can fetch as much as $650. 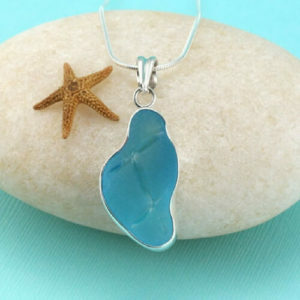 Turquoise is the second most rare sea glass color and the rarest type of blue sea glass. As with orange, there was very little turquoise glass made and none mass produced. The bright electric blue of turquoise is sometimes confused with a deep aqua color but is distinguished by its almost neon like appearance. Most of this color appeared in decorative glassware such as pressed glass candy dishes, vases and and some early seltzer bottles. Turquoise is highly prized by sea glass collectors and jewelers and a genuine specimen is hard to find. 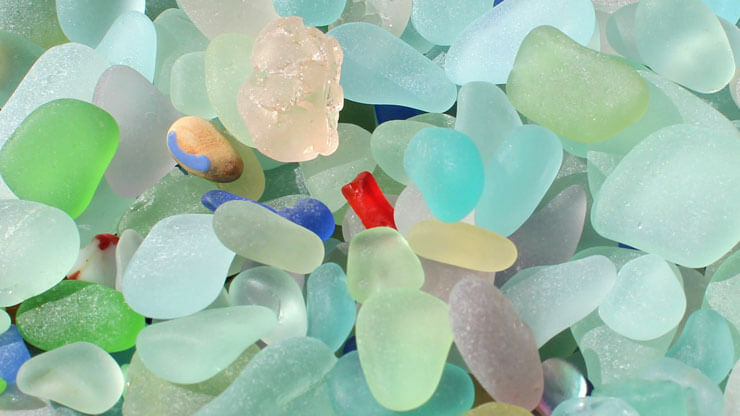 Red is the third most rare sea glass color. 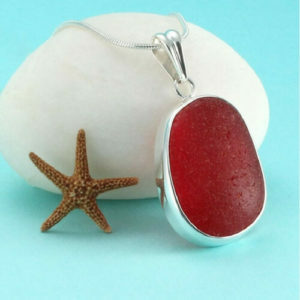 It is the sea glass collector’s Holy Grail, the most sought after sea glass color, maybe because red is a bright, emotional color. Red glass was more abundantly made because it was a popular color for tableware, some bottles, and for utilitarian uses such as red warning lights (car tail lights, ship’s lanterns, railroad warning lights, etc.). At a recent auction, 40 very small, less than dime sized pieces of red sea glass sold for $300. Yellow is the fourth rarest sea glass color. It wasn’t a popular color for bottles, which is where 90% of sea glass comes from, so there was very little yellow glass made and it was used primarily in tableware and art glass, items that would rarely be thrown away. Some yellow sea glass is actually “sun colored” sea glass, originally clear glass that turned pale yellow because its selenium content reacted with the ultraviolet rays of the sun. 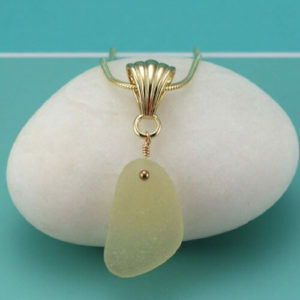 There is very little yellow sea glass available and it is prized by sea glass collectors. Black is the fifth most rare sea glass color. Black sea glass is actually not black, but a very dark olive green when held up to the light. Black glass dates back as far as the 1700s and was commonly used for beer and liquor bottles until about 1870. In the U.S. iron slag (residue) was used as a colorant in the manufacture of black glass bottles and it was thought to contribute to the strength and longevity of the glass. Black glass is highly regarded by serious sea glass collectors. Teal is the sixth most rare sea glass color. Mostly derived from bottles and jars used for ink, mineral waters and wine, teal is an unusual color, part green and part blue. There was a bit of Depression glass tableware manufactured in the teal hue but most of this color is from old bottles made between the 1870s and 1910s. 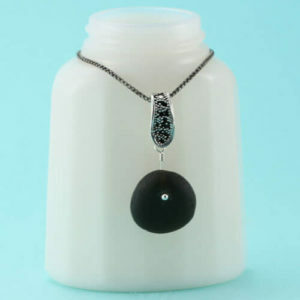 These bottles are very collectible as is genuine teal sea glass which, because of its vintage status, is very popular with both collectors and jewelers. Gray is the last of the ultra rare sea glass colors, coming in at number seven! Most gray glass is sun colored. The original source of this color glass is cut crystal tableware popular from the 1800s – 1940s. Lead oxide was added to the glass batch to enhance the sparkle but also had the effect of turning the glass a darker color when exposed to ultraviolet rays of the sun. Gray sea glass is ultra rare because of its scarcity. There are several shades of gray sea glass, the darker being the most desired. Pink sea glass tops the charts as a rare sea glass color. Its most popular use was for Depression era tableware, but most pink sea glass that we find today is “sun colored pink,” derived from clear glass bottles made with selenium as a decolorant. Via a chemical reaction between the selenium and the ultraviolet rays of the sun, the clear glass ultimately but that turned a light pink/peach hue. 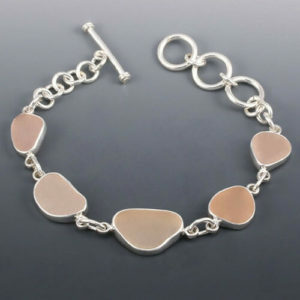 The availability of pink sea glass is very limited and it is highly valued for use in sea glass jewelry. Aqua glass had a modest beginning as one of the most widely used glass colors prior to the 1920s. Bottles, ink wells, electrical insulators, fruit and condiment jars were made using a glass making recipe containing naturally occurring iron content which caused the aqua tint. There are two aqua sea glass hues, light and dark, the dark being the more desirable. 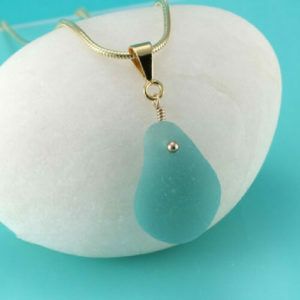 Light aqua sea glass is hard to distinguish from a light blue sea glass color, also called, soft blue or sky blue. There is a diminishing supply of true aqua sea glass. Cobalt and Cornflower Blue sea glass origins are from bottles and jars used for medicines in the 1880s and “pseudo” medicinals in the 1950s such as Noxzema, Vicks Rub, Pepto Bismol, etc. Cobalt blue glass was made by adding cobalt oxide to the glass batch. The lighter hued cornflower blue was made using a smaller amount of the cobalt additive, producing a lighter, more delicate color. Less of the lighter blue color was made so there is less of a supply of cornflower blue. Opaque White (Milk Glass) has a storied history having been invented by the Venetians in the 1500s. 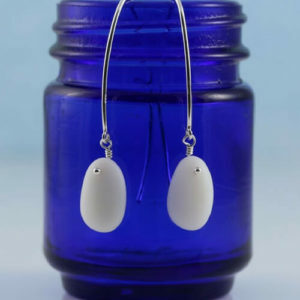 In the US, half of milk glass manufactured was for tableware, 30% for the wide mouth jars used to package the magical face and hand creams of the 50s and 60s (Ponds, Paquin, Jergens, etc.). Unlike other types of sea glass, the opaque white doesn’t appear frosty and it is hard as a rock (and sometimes looks like a white rock). The availability of opaque white sea glass varies depending on location. Purple (Amethyst) sea glass has a history similar to pink sea glass because the majority of purple sea glass is sun colored. Most purple (amethyst) sea glass is derived from clear glass bottles made from @1880 to @1915 with manganese purchased from Germany which was no longer available after the outbreak of World War I. The manganese additive in the clear glass batch reacted with the sun’s ultraviolet rays turning the glass from clear to light purple. 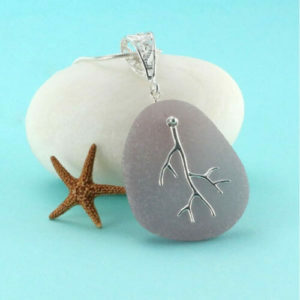 Lavender sea glass is still highly prized in the sea glass community for its rare vintage appeal. Amber/Golden Amber sea glass is not to be confused with the common dark brown (beer bottle) sea glass. Very little of these pleasing earth-toned hues, which provided significant protection from ultraviolet rays, were manufactured. Some amber sea glass shards are as old as the early 1900s when whiskey, snuff and bitters bottles were commonly available in this color. 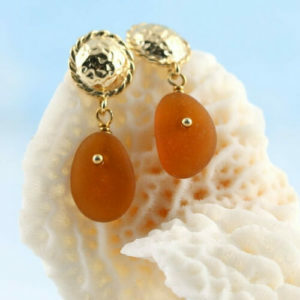 Golden amber, also referred to as butternut, has a slight yellow/gold cast and the amber a more reddish tone. Green sea glass comes in many shades, some more rare than others. The less common shades of green are lime (lemon/lime soda bottles like Sprite and 7-Up from the 1950s) jade (1860s), olive and forest greens (1700s-1900s) (spirits, bitters and mineral water bottles), and UV green (mostly tableware made @1920s with trace amounts of uranium and prone to glowing in the dark!). The most commonly available of the rare greens is lime green. Sea Foam Green sea glass is one of my favorite colors. Most of it comes from old Coca Cola bottles but the sea foam (also called soft green) color was also popular as far back as the early part of the 20th century when it was used for mineral water and potion bottles and some beer bottles. With the exception of the Coca Cola bottle, which was manufactured the world over, these uncommon green colors were not made in large quantities. The color is still available but less so as sea glass hunting becomes more popular. 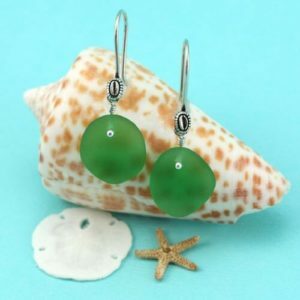 Green sea glass is one of the most common sea glass colors. Green glass has been vigorously mass produced since the 1950s for use as beer and soda bottle containers. We use a bright, medium green hue, like an emerald green in our designs. 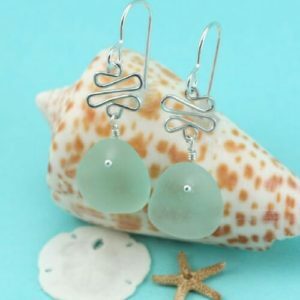 The green sea glass used for jewelry has tumbled in the ocean for 50+ years becoming smoothed and conditioned well enough to become a beautiful sea glass gem. 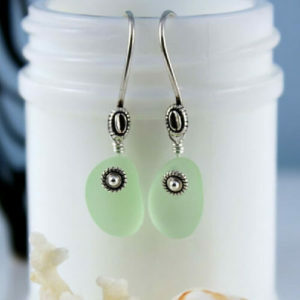 A nicely shaped, well frosted green sea glass gem, is a true sea glass treasure, even if it’s considered a common color! White and Brown sea glass are the most commonly found sea glass colors. Both colors were mass produced for utilitarian use as bottles and containers, white for milk and soda and food and brown for beer bottles and cleaners. White and brown sea glass can be quite old, maybe even dating back to the early 20th century when it was much thicker and heavier than the thin glass of today. Some pieces of white sea glass are pure white, perfectly shaped and frosted. 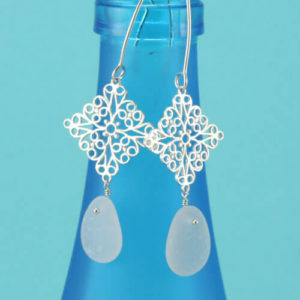 They make stunning wedding jewelry! The study of rare sea glass gems is a captivating window into the past that begins with an understanding of how glass was made, what additives were used to achieve a desired color, and discovering what was sometimes an accidental result of the glass recipe, for example, the purple, pink, yellow and gray sun colored glasses! Please use this reference as the beginning of your journey to learn about rare sea glass colors. You may want to consider a visit to a local glass making studio to see how glass is made. You can also learn more about sea glass by attending one of the many sea glass festivals that are held each year. And there are many wonderful books about sea glass history, origin, colors and locations. Two of my favorites are Pure Sea Glass by Richard LaMotte and The Ultimate Guide to Sea Glass by Mary Beth Beuke. Enjoy your sea glass adventures!